HAPPY BIRTHDAY: (From left) Abdullah Sani, Mohd Asfia, Awang Tengah and Taib having an audience with the Sultan of Brunei. BANDAR SERI BEGAWAN: Chief Minister Pehin Sri Abdul Taib Mahmud led a delegation to attend the Sultan of Brunei Sultan Hassanal Bolkiah’s 66th birthday yesterday. They also attended a Guard-of-Honour ceremony at Taman Haji Sir Muda Omar Ali Saifuddien Bandar Seri Begawan. The ceremony was followed thereafter by the conferment of awards to local and international leaders by Sultan Hassanal Bolkiah. Taib, his wife Puan Sri Ragad Kurdi Taib and members of the delegation then had an audience with the Sultan. Also present were Second Minister of Resource Planning and Environment Datuk Amar Awang Tengah Ali Hassan, State Legislative Assembly Speaker Datuk Amar Mohd Awang Astfia Awang Nassar and Malaysian High Commissioner Dato’ Abdullah Sani Omar. 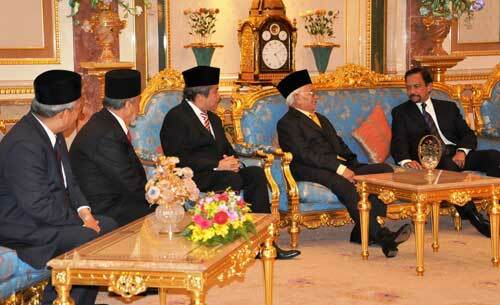 The state delegation also attended a fete at Istana Nurul Iman.